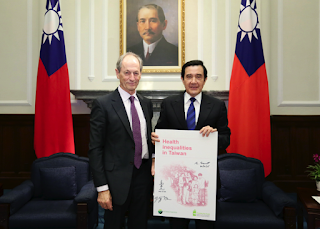 When on a Friday morning, I found myself sharing a joke with President Ma of Taiwan – see photo – my concern was not with international diplomacy but to secure his agreement to whole of government approaches to social determinants of health and health equity. He and I signed a mock-up of the cover of our report for Taiwan. 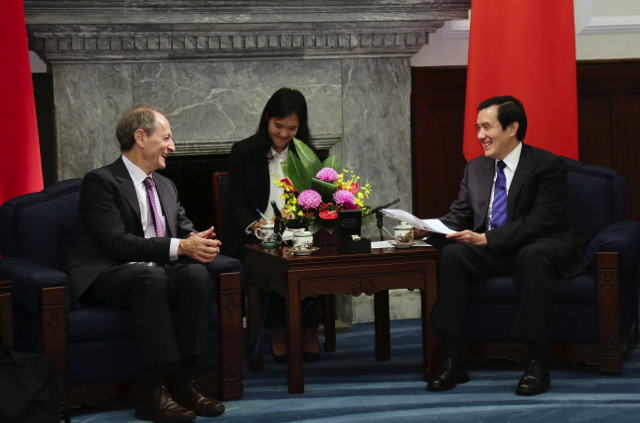 If we take the ‘do something, do more, do better’ mantra to Taiwan, we would have to say, they are in the latter group. Taiwan has done remarkably well. Life expectancy for men is 77 and for women, 83. This would put them firmly in the European average. A huge improvement remarkably quickly. But health inequalities persist – seen in the social gradient in life expectancy and disability-free life expectancy. 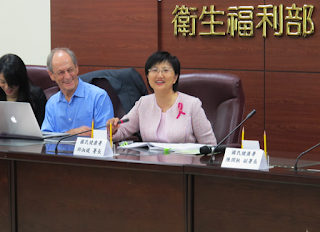 The Director-General of the Health Promotion Administration of the Ministry of Health and Welfare, Shu-Ti Chou, is a charismatic figure – see third photo. Committed, perceptive, well-informed, and clearly loved and admired by her colleagues. I apologised for the depths of my ignorance of Chinese names, but I told her that her name reminded me of the two names in Bertold Brecht’s play, The Good Person of Szechuan. Shen Te was good, caring and generous. But people took advantage of her good nature. She invented an alter ego, Shui Ta, who displayed the more self-centred side of human nature to protect herself. Shu-Ti said that perhaps she embodied a bit of both, caring and concerned, empathetic and embodying better virtues but at the same time having the drive necessary to make progress. As well as the publicly stated commitment from the President, there is a potentially viable mechanism in Taiwan for whole of government action on SDH: the Committee on Sustainable Development. This committee is chaired by the Prime Minister and has the sustainable development focus of environment, economy and social development. By getting health equity into the last of these three and linking it firmly to the other two, there is reall prospect of making progress. We plan to work with Taiwan over the coming year as they seek to make progress.